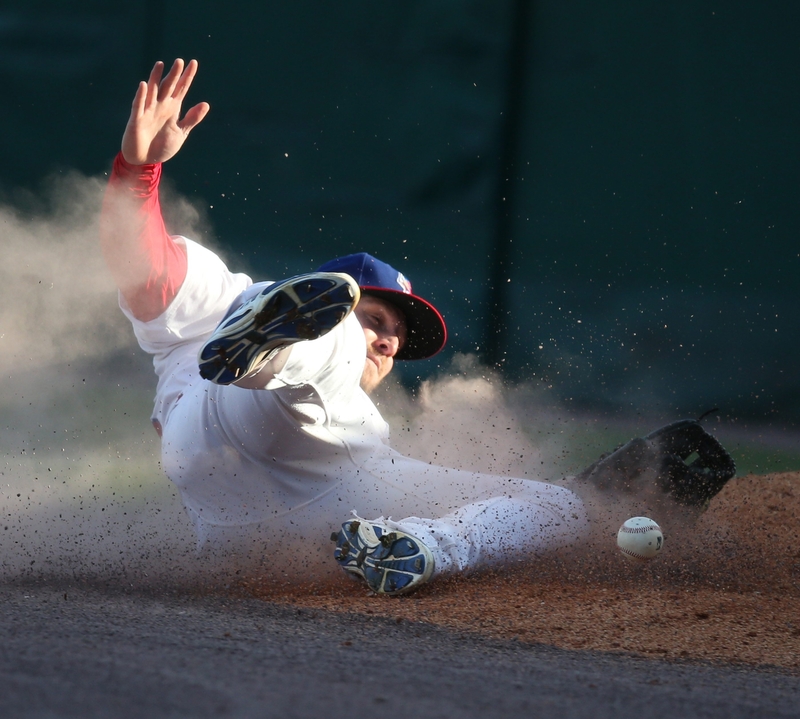 The Bisons’ Brad Glenn makes a diving attempt but drops a fly ball in foul territory in the second inning at Coca-Cola Field. Caleb Gindl was standing at third base, staying near the bag just in case. There was one out in the eighth inning of a tie game and the Norfolk Tides were attempting to intentionally walk Matt Hague to load the bases. Gindl was paying close attention to the play at the plate and couldn’t believe when he saw the ball skip in the dirt. He bolted for home and scored the game-winning for the Buffalo Bisons. Sometimes the unconventional is what gets a team out of a funk. And the eighth inning was about as unconventional as it gets with the biggest offensive plays of the game coming from a guy who went 0 for 3 in the box score and is hitting .148. The Herd took advantage of three miscues by the Norfolk Tides in that inning and came away with a 2-1 win at Coca-Cola Field. “We’ll take anything we can get right now,” said manager Gary Allenson, as the Herd ended a three-game losing skid and scored for the first time in 19 innings Wednesday night. Hague had an RBI double in the first inning to put the Bisons on the board, but the Herd couldn’t generate any offense after that. Gindl has been struggling at the plate this season. He was on an 0 for 9 skid when he stepped into the batter’s box in the eighth. With two strikes, he found a pitch to drive – a hard hit ball to left field. The ball carried over Norfolk outfielder Chris Parmelee, who hustled back and had the ball partially in the pocket of his glove, but couldn’t complete the catch. The ball dropped to the ground and Gindl ran to second. The play was scored an error on Parmelee. Next up was Ezequiel Carrera who put down a bunt to pitcher Michael Bowden. It should have been a routine sacrifice play, but Bowden slipped, Carrera reached first and Gindl took third. Andy Burns popped out to short for the first out. With Hague up, Carrera stole second. Since the double play potential was eliminated, the Tides decided to intentionally walk Hague. That’s when Rossmel Perez failed to catch a low throw from Bowden. The ball was in the dirt and got behind Perez. Hague sprinted home. Hague ended up flying out to shallow right and Andy Wilkins grounded to short to end the inning. Bo Schultz continued the Bisons’ trend of solid pitching, closing out the game with his fourth save retiring all three Tides’ batters with two strikeouts.